Imagine you fall into a freezing lake and get hypothermia. You are rushed to the ER and receive good service initially, but your body temperature continues to remain below 98.6 Fahrenheit. The doctor says he is not sure why you are so cold. It is a puzzle to him and everything he thought he knew about body temperatures seems to be wrong. He says not to worry, though, as he turns on the air-conditioner. All should be well soon, he thinks, once the room starts to cool down. The doctor leaves your room and comes back to check on you after 15 minutes. He finds that your body temperature has dropped even more and that you are shivering. He concludes the room was not cool enough so he dials up the air conditioner even more to really get the cold air blowing. The doctor leaves and returns after another 15 minutes have passed. You are now unconscious, turning blue, and barely clinging to life. The doctor is now even more baffled about body temperature. Oh well, he concludes, there must be some transitory one-off factors affecting your body temperature. Not much the doctor can do about them as he heads out the room and dials up the AC a bit more. Eventually you die. This story is an analogy of how the Fed has been handling inflation over the past decade. Just like falling into a freezing lake is a shock to your body temperature, that Great Recession was a shock to the inflation rate. And just like you being stabilized in the ER, the economy was initially stabilized by the Fed. After being stabilized, though, your body temperature never fully recovered just like the inflation rate never returned on a consistent basis to 2%. 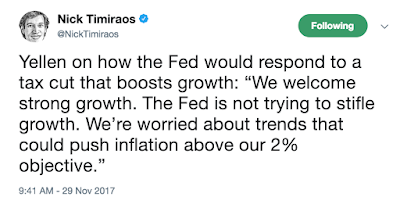 And just like the doctor seems to have forgotten the basics of body temperature, the Fed seems to have forgotten the basics of inflation. Moreover, the doctor is adding to his own confusion by turning up the air conditioner to cooler temperatures just like the Fed is increasingly perplexed as to why inflation remains low as it pushes up interest rates. If the hypothermia story seems absurd to you then the recent Fed behavior toward inflation should also be absurd to you. FOMC members are increasing puzzled by the stubbornly low inflation rate and yet continue to talk up rate hikes on the top of ones they have already done. 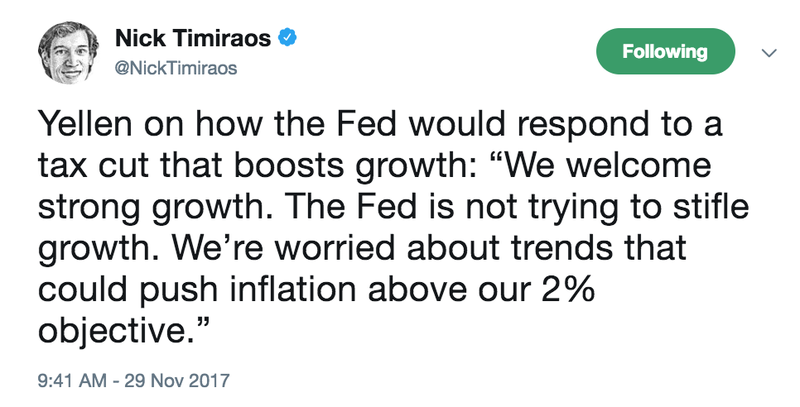 [T]he most significant take away — the new news, if you will — was Yellen’s response to an audience question on why inflation remained so low at a time when the unemployment rate was hovering just above 4%. After running through a “whole range of idiosyncratic kind of factors, most of which may be temporary/transitory things that affect inflation,” Yellen admitted she was “no longer certain” about inflation’s eventual rise. “My colleagues and I are not certain that it is transitory,” she said, referring to the chronic undershoot of the 2% inflation target. So what’s the Fed’s approach to dealing with the chronic inflation undershoot? Why, raise interest rates and pare the balance sheet. If this seems counterintuitive, it is. I have written that the Fed should either put up — run a more expansionary monetary policy to boost inflation — or shut up. Policy makers can’t continue to fret over low, stable inflation, on the one hand, and, on the other, implement policies that, all things equal, will slow economic growth and depress inflation further. [Fed] officials remain perplexed by the past year’s surprising weakness in inflation. And yet there is something truly strange about that. How can the Fed continue to expect rate increases when it has no idea what’s going on with inflation? How can you know the economy will behave in a way that justifies rate increases while simultaneously admitting you don’t know how the economy is behaving? The central bank appears to have put itself in an epistemological jam. So a quick update on that grand monetary experiment in Japan known as Abenomics. Prime Minister Shinzo Abe and his party were returned to power in a decisive October election. This means the Bank of Japan will continue to expand the monetary base, peg the 10-year government bond at 0%, and strive for 2% inflation. I was an early fan of Abenomics, but have become a bit more skeptical over time. Others, like Noah Smith, are convinced it is working and are glad to see it continue. Mike Bird of the Wall Street Journal is also a fan. 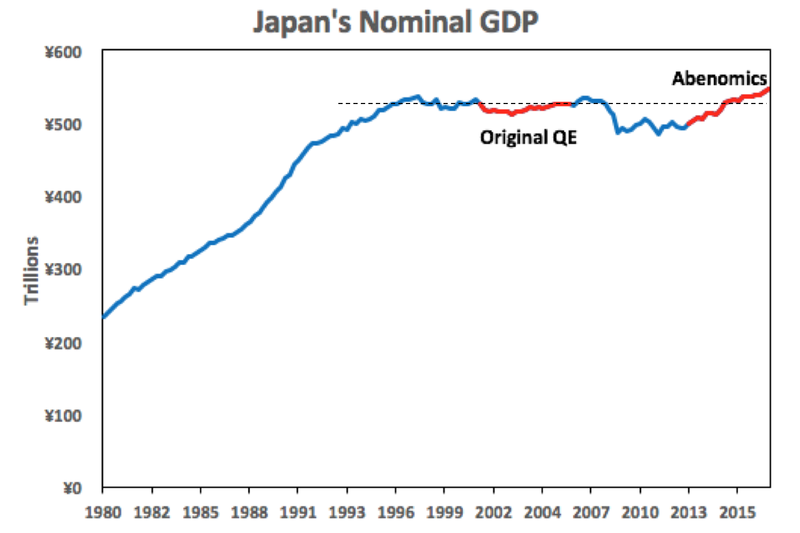 They make a reasonable argument that the real side of the economy has benefited from the Bank of Japan's policies. Maybe so, but what about the nominal side of the economy? Yes, we ultimately care about the real side, but the central bank can only directly affect the nominal economy. Its influence on the real economy is a by-product of this influence. Moreover, getting the nominal side of the economy to rapidly expand is needed to offset the real burden of the growing stock of nominal debt. 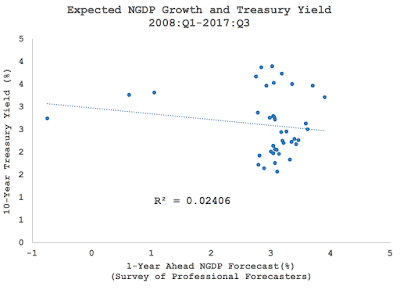 This progress of NGDP is an improvement, but if we step back and look at it from a broader historical perspective it is actually underwhelming. 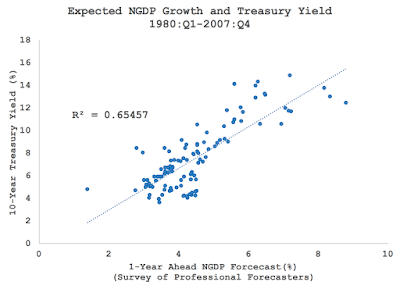 All Abenomics has done is return NGDP to a flat trend growth path. 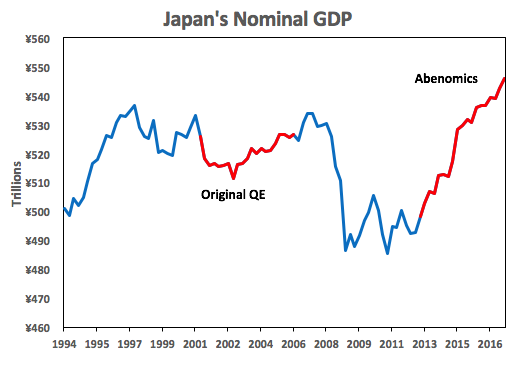 Nominal demand growth in Japan is still far below what it was before the 1990s. This has big implication for Japan's debt burden and suggests its real growth could be higher. 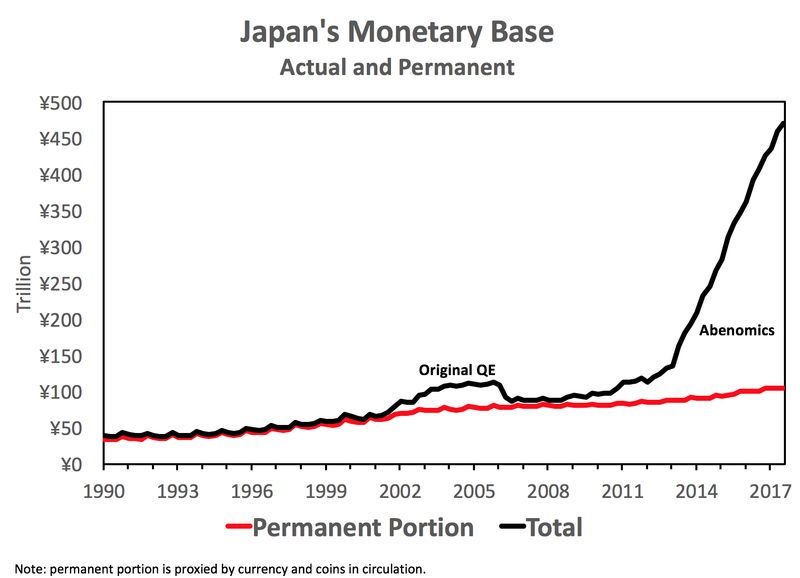 The Japanese monetary base resumed a path that was close to a continuation of its trend prior to the QE period; hence, market participants who had continued to hold expectations about the long-run Japanese monetary base that were unchanged as a result of the QE policy would not have been that far off in their prediction (p. 241). Woodford also notes that this experience comes “fairly close to providing an illustration of the kind of policy to which the irrelevance results of Krugman (1998) and Eggertson and Woodford (2003) should apply". 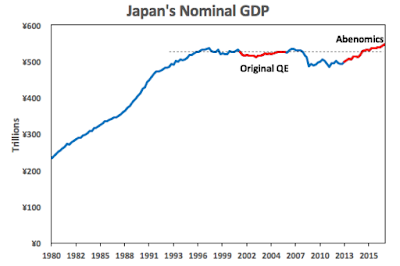 This is the economic answer and the reason I have become more skeptical of Abenomics. 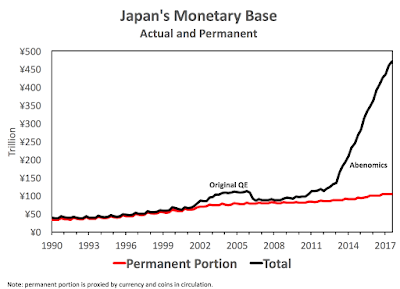 The political answer, in my view, is that the Bank of Japan will not make its monetary expansions permanent and significantly increase the inflation rate is because politically it cannot do so. Japan has an aging population that holds a lot of government debt and lives off of fixed income. Raising the inflation rate would harm them and create a political firestorm. I believe this is what ultimately is keeping Japan from getting robust nominal demand growth. 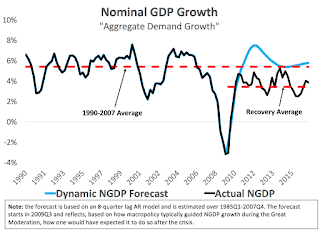 A monetary regime change has occurred that has lowered the growth rate and growth path of nominal demand. 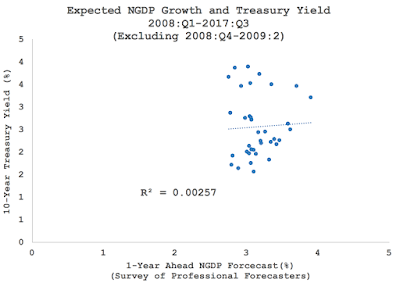 Since the recovery started in 2009Q3, NGDP growth has averaged 3.4 percent. This is below the 5.4 percent of 1990-2007 period (blue line in the figure below) or a 5.7 percent for the entire Great Moderation period of 1985-2007. 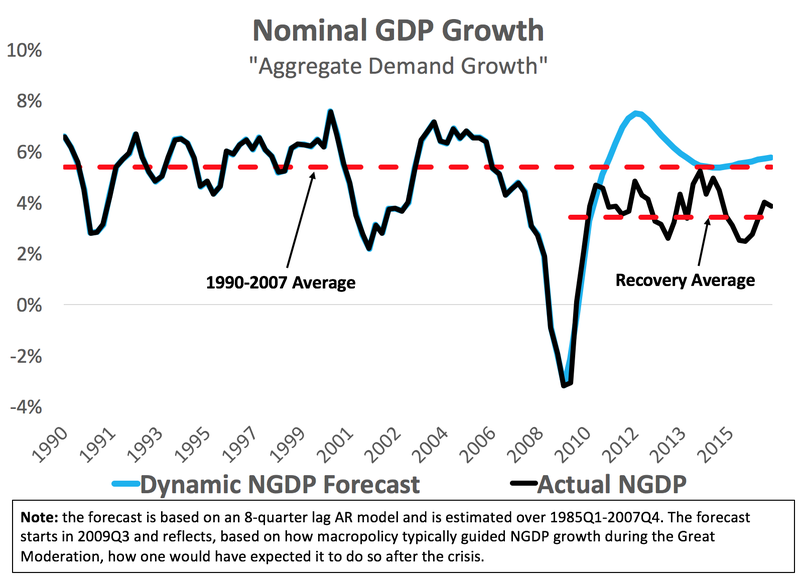 Macroeconomic policy has dialed back the trend growth of nominal spending by 2 percentage points. That is a relatively large decline. This first development can be seen in the figure below. Again, these two developments are, in my view, the real story behind the drop in trend inflation. And to be clear, I think both the Fed's unwillingness to allow temporary overshooting and the safe asset shortage problem have contributed to it. I went on to say this is the monetary regime change no one asked for. It is also one that many observers seem to miss in their analysis of Fed policy since the crisis. Well, I was on twitter discussing long-term treasury yields and monetary policy with Tim Duy and Joel Wertheimer. 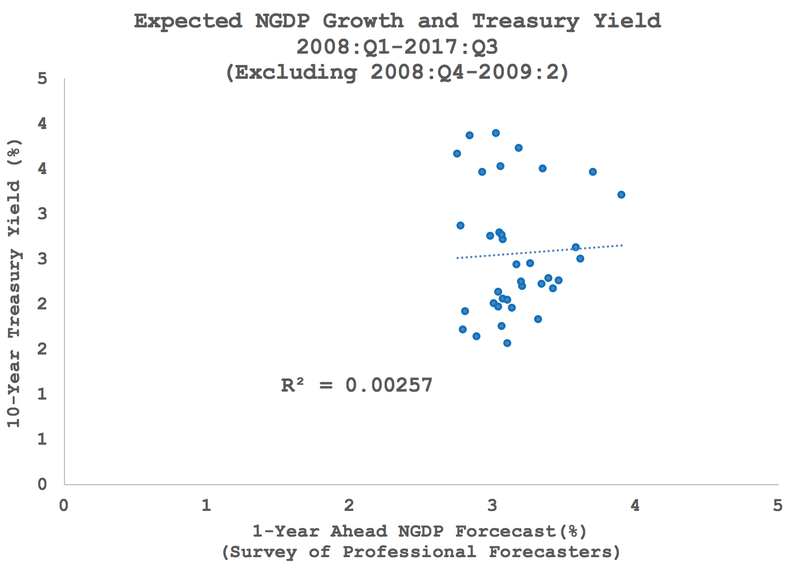 I decided to whip up some charts comparing 1-year head NGDP forecasts from the Philadelphia Fed's Survey of Professional Forecasters against 10-year treasury yields. The results, in my view, are consistent with the claim that there was a monetary regime change in 2008. 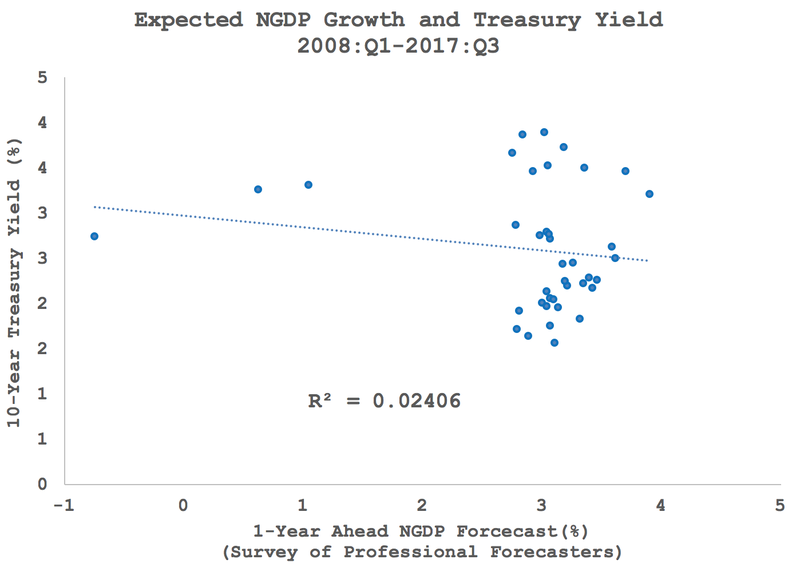 So something has changed in the relationship between expected NGDP growth and long-term treasury yields. The monetary regime change story outlined above coincides closely with this breakdown. Here is one way to connect these two developments. Before 2008 the Fed allowed its tightening to follow the pace of recovery, whereas afterwards the Fed has tended to get ahead of the recovery in its desired and actual rate hikes. If so, the Fed's tightening post-2008 would have slowed down the recovery and lowered the expected future path of short-term interest rates. 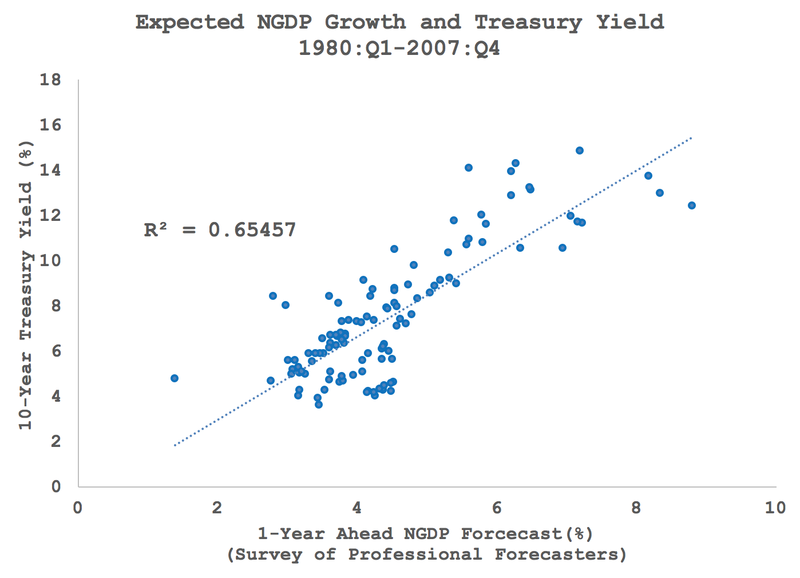 This overreacting by the Fed would have kept long-term interest rates from rising with expected rises in NGDP growth. This type of behavior would also be consistent with a monetary regime change where only low rates of NGDP growth and inflation are tolerated. This is what appears to have happened in 2008.